Scalp hair grows at an average of half an inch a month. According to The American Academy of Dermatology, 90% of hair is growing at any given time. The average person typically sheds around 100 hairs per day. The body naturally replaces those hairs, but it becomes harder to do with age. Hair loss is a frustrating part of aging that can be accelerated by a number of things, including stress, hormone fluctuations, and vitamin deficiencies. There are several natural treatments that can help prevent hair loss and promote healthy hair growth. Avocadoes are a rich source of essential fatty acids that are also extremely beneficial for skin and hair. 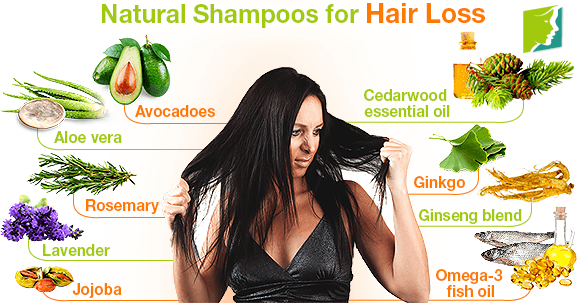 Avocadoes provide natural moisture to hair and follicles, promoting healthy, strong hair. Aloe gel opens up blocked pores of the scalp to prevent infection and clear the way for new hair to grow. Rosemary oil nourishes hair follicles, strengthens hair, and reduces hair thinning and balding. It also helps circulation in the scalp, which promotes hair growth. Lavender oil not only soothes the skin, but it is antibacterial in nature, so it helps treat irritations and infections. It also nourishes the scalp and helps remedy dryness and dandruff. The soothing scent of lavender is also known to reduce tension and stress. Jojoba oil is commonly used in shampoos and for hot oil treatments because it is believed to stimulate hair growth. It is anti-inflammatory and soothing in nature, and is useful for unclogging pores. Cedarwood has been shown effective in treating hair loss, namely a genetic form of baldness called alopecia areata. It's most effective when blended with rosemary, jojoba, and lavender. Ginkgo is a well-known antioxidant, and it has been shown to support blood circulation. The increase in blood flow promotes hair growth. Studies have shown that ginseng, a traditional Chinese herb, can help regenerate hair and reverse loss. Fatty acids provide oils that hydrate the hair and scalp and help speed up hair growth by processing the vitamins and minerals that are necessary for healthy hair production. They can also add shine to hair. Hair loss occurs when hair follicles shrink over time, causing thinner hair. Likewise, hair loss is an inevitable part of aging. Stress, hormone fluctuations, and harsh styling with hot tools cause hair loss. However, there are natural shampoos that can be applied to the scalp to strengthen hair and stimulate hair growth. These include avocadoes, lavender, and rosemary oil. Additional treatments include letting hair air dry, drinking plenty of water, and eating nutrient rich foods. For many women, hair loss is a surprising and stressful part of menopause and it can affect self-esteem. Keep reading to know more.